The White House is defending changes to Medicaid financing in the Senate health-care overhaul bill by saying that the Better Care Reconciliation Act (BCRA) actually increases Medicaid spending. In the tweet, Trump included a graph that showed the spending increases from 2017 to 2026. White House senior adviser Kellyanne Conway recently made a similar claim on ABC’s “This Week”: “These are not cuts to Medicaid. … This slows the rate for the future and it allows governors more flexibility with Medicaid dollars because they’re closest to the people in need.” Does Medicaid spending actually go up, not down, in the Senate bill? The Senate bill would phase out the Medicaid expansions under Obamacare by reducing the federal match for newly eligible adults, place a cap on the federal reimbursements to states, and lead to fewer people being enrolled than under current law. So far, 31 states and the District of Columbia have expanded Medicaid eligibility. The nonpartisan Congressional Budget Office estimates that under the Senate bill, states will start rolling back their expansions, and people who newly became eligible under Obamacare no longer would qualify. Trump says Medicaid spending “actually goes up” because he is referring only to the raw dollar increase between $393 billion in 2017 and $464 billion in 2026. But that omits the other part of the full picture: The Senate bill significantly reduces how much the federal government would spend on Medicaid in future years compared to projections without a change in the current law. It would lead to 15 million fewer Medicaid enrollees by 2026 than there would be if current law stayed in place. For context, Medicaid expansion under Obamacare provided insurance to as many as 14 million more people. Here’s what this looks like, in context. Trump’s tweet only shows the lower line, not the one above or the gap in between. During the campaign, Trump promised not to cut Medicaid. So now, the rhetoric he and his aides use is that Medicaid spending “actually goes up” or that the bill “slows down the rate of spending.” One health-care policy analyst explained it this way: Say your employer told you that your salary will go up every year by 2.5 percent to account for inflation. But instead, you get a 0.5 percent increase, even though the cost of your living expenses increases 2.5 percent with inflation. You can call that a “reduction,” a “cut,” or a “slow rate of growth,” but ultimately, you have less money than you would otherwise. 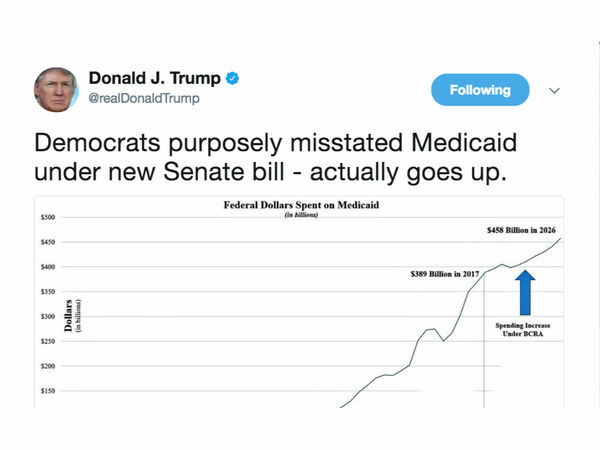 In defending the changes proposed in the Senate legislation to Medicaid financing, Trump says Medicaid spending “actually goes up” through the bill, and showed a graph indicating such an increase. But that’s quite misleading. It’s just one part of the picture that omits the fact that if the Senate bill as written by the date of his tweet becomes law, federal spending would be reduced by $772 billion over 10 years, according to the nonpartisan Congressional Budget Office. Moreover, 15 million fewer people would be enrolled in the program over 10 years than would be under current law. Trumps misleading graph is dishonest cherry-picking and fails to also depict Medicaid funding for the next ten years under Obamacare. 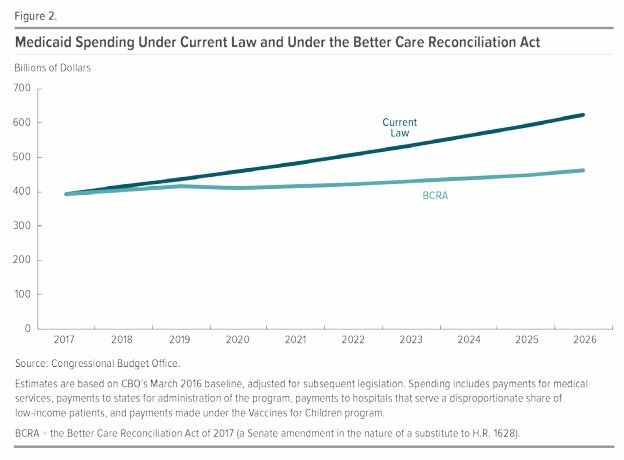 As you can see in the second graph above, the disparity between the Senate BCRA bill ($464 billion) in 2026 and current law - Obamacare ($624 billion) in 2026 is -$160 billion. Trump is peddling the notion that the Senate BCRA bill actually increases Medicaid spending and the bill is a great deal for Americans. But when placed in the proper context of a comparison with Obamacare, the funding shortfall is $160 billion with an additional 22 million Americans uninsured. Don't believe the snake-oil con man.